Artist Emma Akmakdjian, left, was working to get her work ready for display. KINGMAN – The best way to learn about art is to immerse yourself. Downtown Kingman’s first First Friday event of 2019 kicks off at 5 p.m. on Beale Street tonight. In cahoots with the street festival is the Arthub at the corner of Fourth and Beale streets. Director Anna Fox Ryan and the new residents are encouraging the public to step in and learn how, why and where their inspiration comes from. 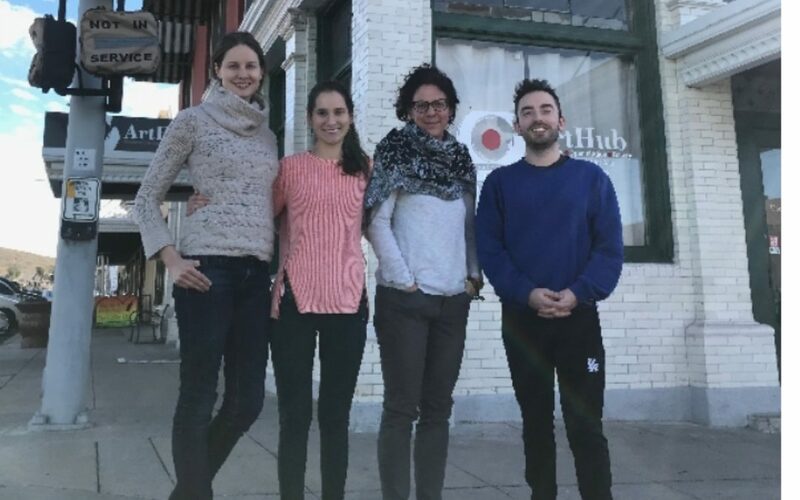 There will be six artists in town for the first 2019 residency. The Arthub will offer demonstrations for the February, March and April First Friday events. The three artists that will be starting, polishing and finishing their work this Friday are Jonah King, 33, from Dublin, Ireland; Areala Kumarae, 55, from Minneapolis, Minnesota; and Emma Akmakdjian, 23, from Los Angeles. Ryan will also be putting a few projects in motion while greeting guests. Ryan has been in Kingman since 2017, but the new residents planted flag within the last two weeks and their reasons for transplanting themselves from their former artistic residencies and habitats vary. Akmakdjian is bringing a tactile vision of water issues from her California roots to Arizona. 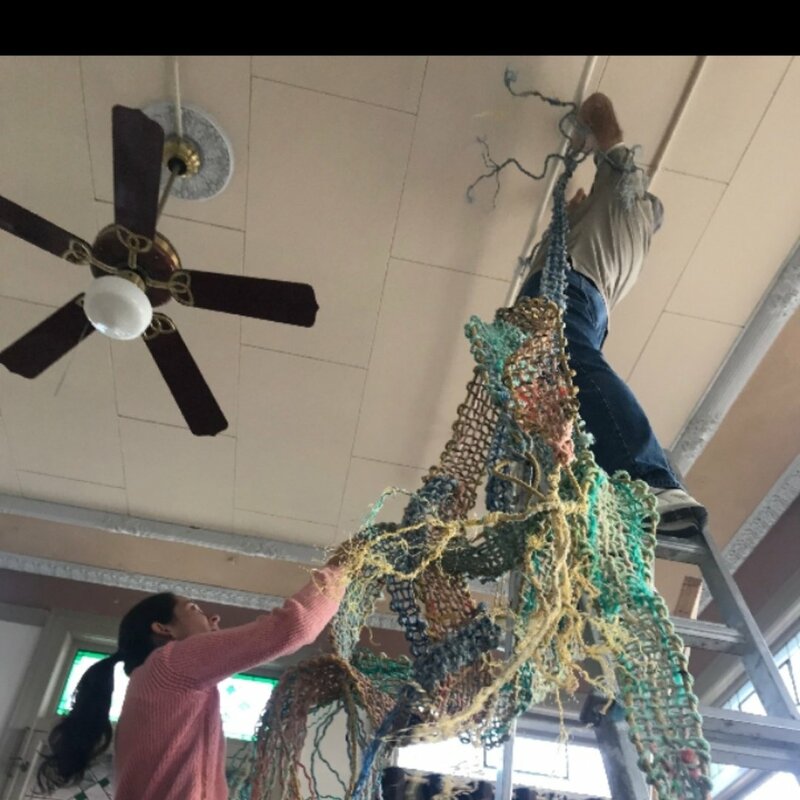 She’s been weaving a three-dimensional tapestry from strands of boat and lobster trap lines collected and sorted from hundreds of pounds of trash in the Pacific Ocean. An Arthub maintenance man was drilling holes in the ceiling and helping Akmakdjian hang the tapestry stretching at least ten feet high. “This is a monument to water,” she said. King is a video artist. He puts the visual media most of see on a regular basis into what could be considered traditional sculptures and picture frames. After a residence near Joshua Tree and a few excursions throughout the Mohave Desert, King was entranced by the landscape and geology. He’s combining his imagination with modern media. Artists use different mediums to convey their thoughts and perspectives. While one uses a Macbook, another uses the sand and weeds around them. Kumarae renders the local ecosystem into mixed-media combinations of paintings, sculptures and other three-dimensional works of art. She’s picked rocks and plucked flowers. All from within a few miles of her table at the Arthub. “My work is tactile,” she said while shimmying and shining Kingman turquoise to see how it might fit into her work. The Minnesota native came to Arizona to enjoy endless miles of solitude and change of color. Each of these artists have a story and they have enough time to tell it – in the form of art in motion. A quick gaze through the windows of what many Kingmanites knew as other businesses once one day can now see another transition into southwest history. This time, the public, from Kingman to Quartzsite, are invited to get a hands-on part of that history. First Friday starts at 5 p.m. TONIGHT! Temperatures in Kingman are predicted to be in the high 50s to low 60s, so basically March in February. For more information on the Arthub’s residents and hours, go to HYPERLINK “http://www.kingmanarthub.com” www.kingmanarthub.com. To get involved with First Friday, visit HYPERLINK “http://www.kingmanmainstreet.com” www.kingmanmainstreet.com.